Details leaked on new flagship Samsung Android phone? 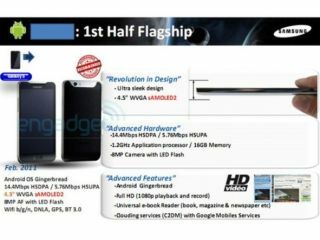 Samsung's next flagship Android smartphone could be with us early next year, with a powerpoint slide leaking some of the specs for the next-generation handset. Samsung's Galaxy S has sold well for the company and the company will be keen to build on that success. A slide discovered by Engadget has pointed to the arrival of a next generation phone that brings some pretty impressive specifications – inevitably including the company's well-received super AMOLED screen technology. That WVGA screen is a either a whopping 4.3 or even larger 4.5 inches (the slide gives both sizes in different sections) and the inclusion of an 8MP camera, Full HD playback and a super-speedy 1.2GHz processor will have phone aficionados licking their lips. Other details include 16GB of internal memory, the latest Wi-Fi and an 'ultra sleek design', with Android Gingerbread as the OS. The slide does have some rather strange inclusions – including a picture of a VoIP handset from Apiotek – which inevitably cast some doubts on the entire rumour. But, specs wise, this would appear to be a relatively believable next generation handset from Samsung; large screened, faster and sleeker, as it looks to establish itself as the home of great Android phones.